Will you ever find a prettier Spring / early Summer than Ramster. We do not think so! 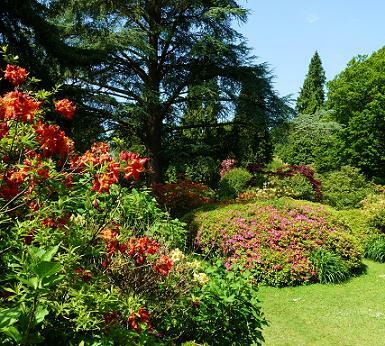 The delightful Ramster Gardens were first laid out in 1890 by Sir Harry Waechter and Gauntletts nursery of Chiddingfold.They were further developed in the 1920s when many of the rhododendrons and azaleas were added. There are many different varieties and colours as well as other woodland plants and flowers. From April to mid June the Gardens are a riot of colour with beautiful reflections from the ponds. What is nice here compared to other gardens with similar plantings is the naturalistic woodland setting with well thought out paths and view-points. Lakes and pools add to the interest with amazing colours and reflections. Allow a couple of hours to see the gardens and make sure you take your camera with you. 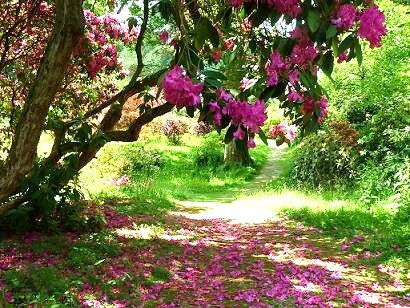 This is a Spring Garden not to be missed and well worth travelling a distance to see. 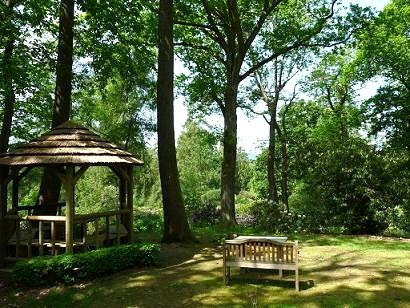 Sir Harry Waechter laid the foundations of the present garden, he created them in the ealy 1900s out of the oak woodland. He was helped by the well-known nurseries, Gauntletts of Chiddingfold, whose Japanese nursery adjoined the garden. Gauntletts were famous for their interest in Japanese plants and ornaments and the Japanese influence is still maintained in the garden today. The stone lanterns, the cranes, now happily feeding in the pond, the clumps of bamboo, the masses of evergreen azaleas and the avenue of maples are typical of the Japanese style features used in the gardens they designed. (from Ramster Gardens Website). Following on from this in 1922 the property was bought by Sir Henry and Lady Norman. Lady Norman was the grand-daughter of Henry Pochin, who started the famous gardens at Bodnant in 1875, and was no doubt infuenced by him adding many more plants including azaleas and rhododendrons. Autumn opening see website. This opening is for the spectacular Autumn colour, including our exceptional display of Japanese influenced plants, with an avenue of ancient Acers, a sight not to be missed!Tea Room, Plant sales, Dogs on leads, Good Disabled access.